← My Google Hangout Seminar on Invisibility Physics! Been away from blogging for a while due to work and stress — going to start catching up on my book blogging! A massive, mysterious alien craft is spotted in solar system, seemingly dormant. A team of scientists and astronauts are sent to intercept the craft and unlock its secrets — and uncover its occupants. It is a familiar start to a science fiction story — Arthur C. Clarke’s Rendezvous With Rama, for instance — but in Jennifer Foehner Wells’ 2014 novel Fluency, the story quickly takes a very different and unusual turn. The alien craft, known only as The Target, was first spotted by NASA in the 1960s, nestled within the Greater Asteroid Belt. Since then, NASA kept a watch on it, using every Mars probe to take images secretly. But when a rogue asteroid is predicted to collide with The Target within several years, a human mission to the mysterious craft is hastily planned. As the novel begins, the Providence approaches The Target, its crew ready to explore. On board is Tom Compton, the pilot, Mark Walsh, the commander, Alan Bergen, the aeronautics engineer, Ajaya Varma, the flight surgeon, Ron Gibbs, the electrical engineer, and Jane Holloway, the linguist. Holloway, a Professor of Linguistics, has been brought on the mission because of her instinctive mastery of any language she encounters. If there is contact with alien life, she will be the Earth’s official spokesperson. And as they approach The Target, they find that lights now illuminate what appears to be a docking port, leading to speculation and concern that they are being invited in. Regardless, nobody — human or otherwise — meets them at the port. As they start to explore, however, Holloway starts to receive powerful, disorienting, messages from what seems to be an alien intelligence. It relays instructions to the explorers through her, leading them deeper into the depths of the alien craft for some unknown purpose. But is it seeking to help them, harm them, or something else entirely? Fluency is a fast-paced novel, taking the reader along through a number of twists and turns and multiple perilous situations. The secret motivations of the alien intelligence keep the reader guessing until the very end of the novel, and the revelations at the end are satisfying. Though Fluency is classified as a space opera, Wells does not neglect the science. It is well-thought out and often plays a significant role in the story, and gives it a sense of realism that one doesn’t often expect from the sub-genre. I found the ending of the novel particularly clever. 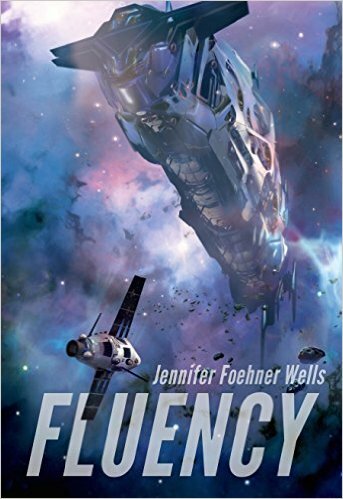 I understand that Fluency is the first in a planned trilogy, and its conclusion manages to work both as a cliffhanger as well as a satisfying ending in its own right. In conclusion, Fluency is an excellent debut novel by Wells. I am excited to see where she goes next, both with this series as well as other works! I like aliens, Fluency is a great story!